I was fortunate enough to be invited to this years Teen Choice Awards. It was a fun event indeed. I think I’m deaf for a few days do to the swarms of literally screeching teens, but I then remind myself I was one of those screeching teens just a few years ago. Next year, I’ll either be presenting, hosting red carpet or supporting my boo as he accepts his surfboard for Choice Male 🙂 Only time will tell. Living the Hollywood life means you get to experience certain perks that sadly, others don’t. Case in point, a random Tuesday at E! and its pure mayhem outside. A little band called the Jonas Brothers are in the studio with Ryan Seacrest for a post Teen Choice interview. As expected, some fans camped out for two days to see the young pop stars. While yours truly simply strolls in to another day at the office and gets the rare opportunity to chat with the boys. I’m later told by all my young fans how lucky I am. This is very true, I am extremely lucky. But then again I do believe Luck = Opportunity + Preparation. 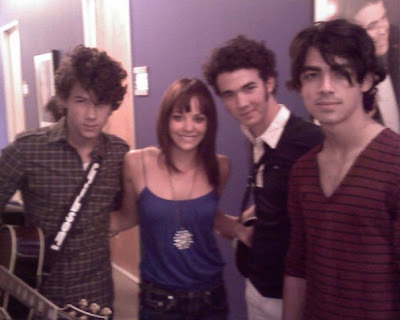 Nevertheless, Nick, Joe and Kevin certainly made a fan out of me. They are extremely polite and so good to their fans. Good to see some of young Hollywood is taking the high road, this stylish trio certainly is.